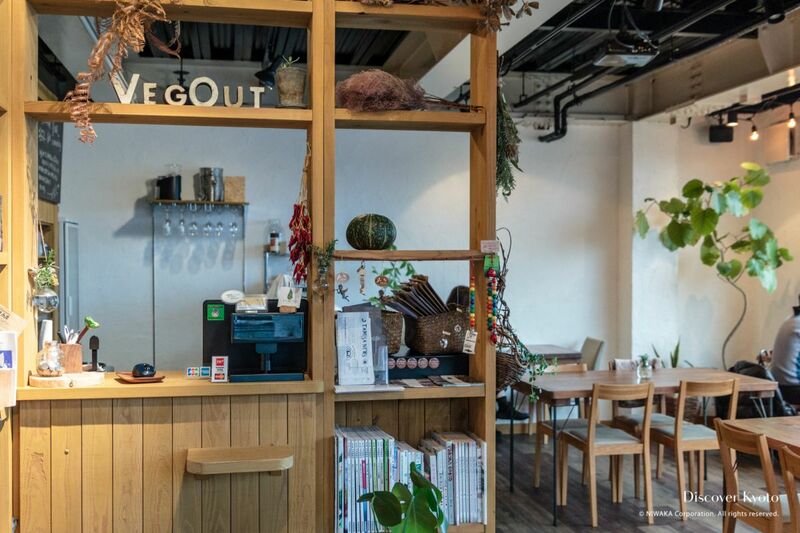 Visitors might be surprised to find that in Kyoto there are quite a few cafés and restaurants that serve vegan and/or vegetarian food. Having dietary restrictions while you’re traveling can be stressful, so Discover Kyoto has picked up a few of our favorite vegan and vegetarian restaurants to introduce. These places are so good that even people who don’t follow a plant-based diet will want to try it out with you. If you’re looking to experience what authentic Japanese vegan food tastes like, you’ve come to the right place. Hale offers yuba-based meals with seasonal vegetables. Yuba is made out of the film that forms when you boil soy milk, and has a really soft texture to it. Hale serves rice bowls topped with yuba and a delicious Japanese style sauce. If you like tofu, you are almost guaranteed to like yuba as well! The restaurant is situated in the heart of Nishiki Market, and though the market itself is famous for its vibrant and bustling atmosphere, inside Hale is quite the opposite. The restaurant is an old, renovated machiya home with a beautiful Japanese garden, which makes it the perfect spot to relax and unwind from a busy day of walking. COCOLO KYOTO was the first ever granola store in Kyoto! 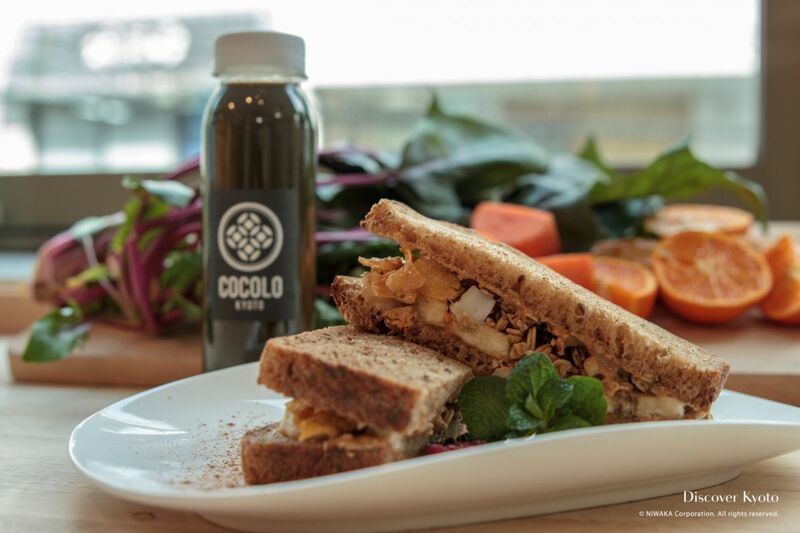 While they are famous for their unique and tasty granola flavors such as green tea and miso, they also recently started serving cold press juice. The cold press juice is made out of organic and seasonal vegetables and comes in two flavors: green juice and carrot juice! If you want to take a break from all the extra vacation calories you have been consuming, detox with a fresh green juice from COCOLO KYOTO. We ensure you the freshness of the juice will take your energy level from a 3 to a 10. If you’re looking for a little snack, the café also serves smoothie bowls, ice cream, and peanut butter & banana sandwiches! Located on the river banks of the Kamogawa, Veg Out is a place where you can enjoy your healthy meal with a view! 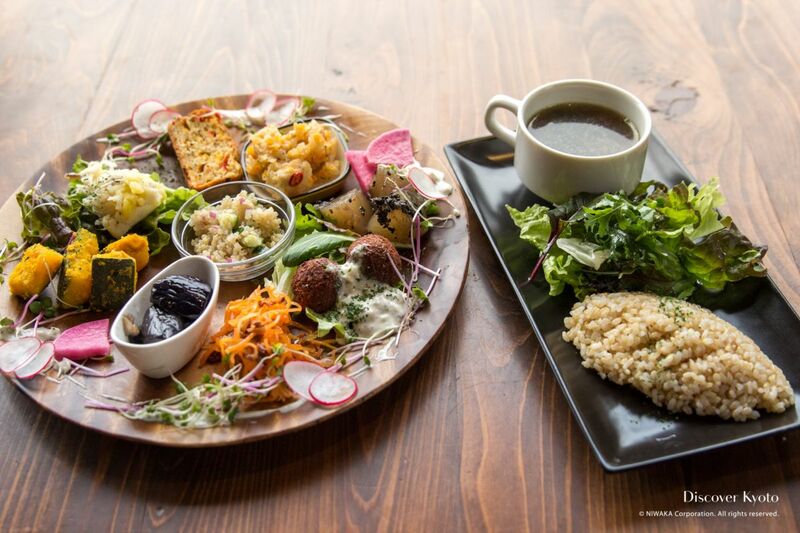 Although Veg Out is a restaurant that serves vegan food, the owner’s philosophy is that you don’t have to be vegan to be healthy or enjoy the meals at Veg Out. Even a small change in your lifestyle can make a big difference. The restaurant serves a colorful lunch plate that is easy on the eyes as well as being delicious- our favorites were the pumpkin salad and the eggplant. There are so many delicious bites on your plate that you won’t know what to eat first! Who said vegan food was boring? If you feel like eating out a bit fancy, head down to Ukishima Garden. 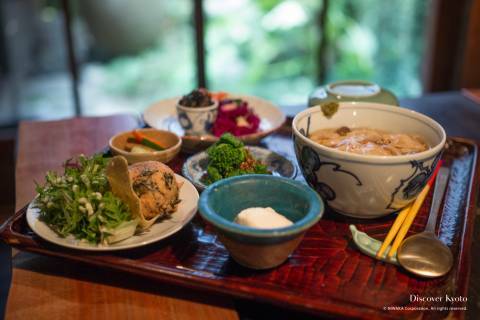 Situated in the city center, Ukishima Garden is a restaurant that serves beautiful and elegant vegan food which is inspired by shōjin ryōri, (traditional Buddhist cuisine eaten by monks). 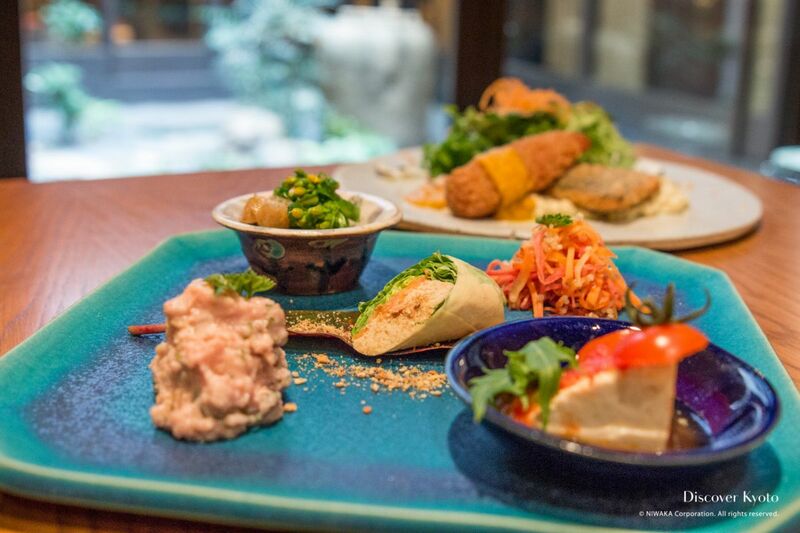 The restaurant uses organic vegetables, grains, and authentically prepared condiments as part of their contemporary twist on the culturally rich shōjin ryōri . The restaurant, which is an old machiya home, has a beautiful wooden interior and features a stunning Japanese garden, making it an ideal place to enjoy your elegant vegan meal with a glass of wine.